Design bio fireplace, created by Ora-Ïto in cooperation with Cogitech, is a note of modernity and quality in all its glory. 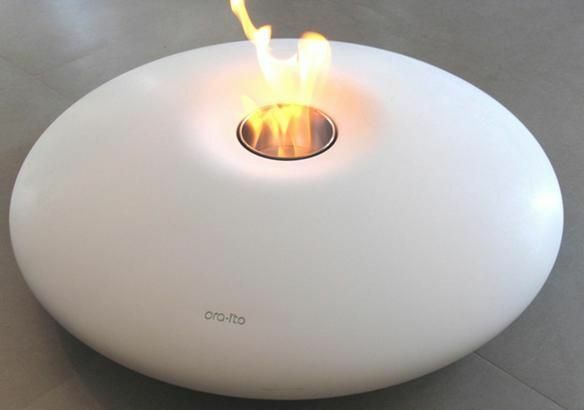 Portable, small bio fireplace, built of two halves – is an excellent addition for modern and spacious interiors. Apparently it looks like a stone and it is associated with harmony and piece. Staying near can remind us of rest in a high class SPA. Bio fireplace weighs less than 25 kg, so we can move it and place in a bedroom, garden or any other place – without any problem. It will perfectly match to the aesthetics of a bathroom, where we would like to bring an atmosphere of luxury SPA. The burner is open, powered by bioethanol. Due to ceramic insert the produced warmth holds longer. The dimensions are as following: diameter 70 cm, height 18 cm. The small sizes are exceptional advantage of this bioethanol fireplace. Round shapes and delicate flame, coming from beautiful, white stone, is a magic of bio fireplace by Ora-Ïto. It will match to every type of interior – minimalistic, classic and modern. Everyone will experience some relax and oblivion. Feel like at home SPA!